Winter can bring harsh weather conditions that could impact not only your property, but also your business operations. Since daylight saving time ends this weekend, it’s the perfect time to begin preparing your business for winter and its extreme weather. What are your winter weather threats? Winter affects places and businesses differently. It’s important to be aware of the potential risks your business could face during severe winter weather. Could your business be impacted by any of the following? 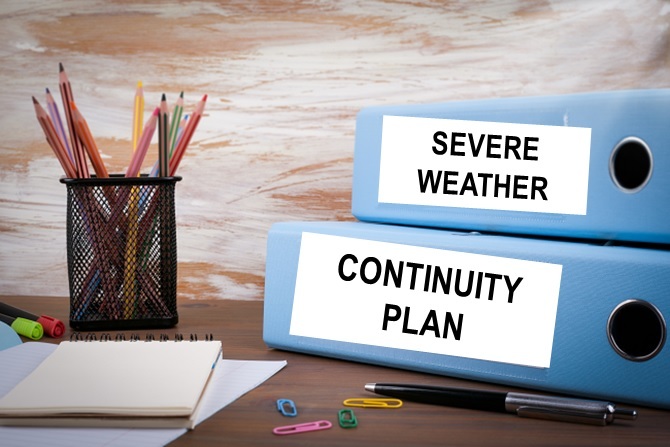 Do you have a severe weather continuity plan? Now that you’ve identified the risks to your business, do you have a plan to manage them and minimize your business interruption? If your business is susceptible to snowstorms, do you have a plan to set up your employees to work remotely in case roadways are inaccessible? If a power outage is possible, do you have backup power generators to keep your business running? Extreme winter weather can impact the structure to your building, and this can be very costly to repair, plus it may force you to close. It’s important to perform a thorough inspection throughout your property to ensure it can weather any winter damage. Mold from melting snow and ice seeping into your building could cause costly damage to your structure and be detrimental to your and your staff’s health. Check your property carefully for drafts, leaks and cracks on your roof, doors and windows. Another common winter weather threat is from frozen pipes. Shut off outdoor plumbing so remaining liquid doesn’t freeze and break your pipes. Listen to the local weather news for storm warnings and updates. Keep your employees informed of the updates and your emergency business continuity plan. How will you handle your customers during severe winter weather? Save a list of key clients and vendors and their contact information, so they can be contacted of severe weather and any change of operations. If your business occasionally has client visits, consider adding a safety plan for them to your emergency strategy. « Is Your Property Safe from Vandalism on Halloween?